Posted in Amanah, Anwar Ibrahim, Barisan Nasional, Character and Integrity, civil society issues, Corruption, Crony capitalism, DAP, Democracy, Dr. Ahmad Zahid Hamidi, Freedom, GE-14 Malaysian General Election, Governance, ketuanan melayu, Law and Order, Leadership, Malaysia, Malaysiakini, Najib Razak, Pakatan Harapan, Parti Pribumi Bersatu Malaysia, Politics, Public Accountability, The Malays, Tun Dr. Mahathir Mohamad, UMNO. COMMENT | Feelings of schadenfreude, the expression for which we’re indebted to German, and is defined in English as ‘pleasure at learning of or witnessing the troubles, failures or humiliations of others’ may not be a terribly noble, but it’s a fact of life that this happens to be one of the many ways in which we humans are flawed. Or at least I’m happy to admit that I am. If there’s one class of fellow humans I hate, it’s liars, frauds and fakes. And thus I’m over the moon at the spectacle of former prime minister Najib Abdul Razak, former first lady of Malaysia Rosmah Mansor and current UMNO President Ahmad Zahid Hamidi facing their moments of truth. Of course, none of them has admitted the truth of the countless charges or masses of evidence against them.Nor, admittedly, as some readers are sure to rightly remind me, are they required to do so, given their right to be presumed innocent until proven guilty. A situation that is far more generous than prevailed back when fake UMNO-BN “justice’” was meted-out against innocent witness Teoh Beng Hock, who fatally “fell” from a 14th-floor window at MACC headquarters; Scorpene-scandal translator Altantuya Shaariibuu who was shot and then disposed of with C4 explosive and countless “suspects” summarily executed in suspicious “shoot-outs” with the police. But these UMNO-BN suspects have at least been questioned, investigated, accused and charged, and thus I feel justified in feeling a small frisson of schadenfreude in anticipation of a far bigger one when they eventually face trial and thus the possibility of conviction and imprisonment. And not just imprisonment, as that would be mere retribution. They should also be required to make restitution to Malaysia and Malaysians of all their fraudulently-acquired assets. Unfortunately, such a desirable and indeed delightful result is way in the future for the few big fish the law has netted so far, but there are plenty of smaller-fry alleged UMNO-BN fraudsters for the forces of law and order to bring to book and thus sustain our schadenfreude in the meantime. In fact, many of them, both already and yet-to-be charged, are apparently so incurably addicted to falsehood, fakery and fraudulence as to be beyond redemption. Najib (centre in photo), for example, had the effrontery, not to mention the deficiency of any sense of irony, to claim that he turned up in court yesterday to lend Zahid his “moral” support. 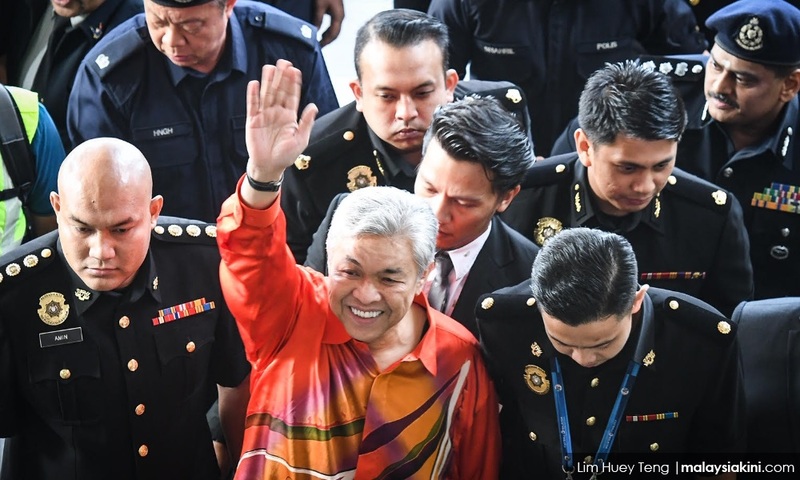 And for his part, Zahid himself saw fit to engage in his customary fake piety, proposing that the same God he formerly credited with choosing him for high political office is now putting him to a test that he intends to pass by clearing himself of the charges he faces. Meanwhile, as usual, his sanctimonious accomplices and supporters in his alleged preying on the populace were urgently praying and urging others to pray to the same God. All such fantasies on the part of the fraudulent are nothing but further fuel for us schadenfreude fans, of course. But, to finish this column on a more positive note, as dedicated as I and doubtless many others are at seeing as many frauds as possible getting their just desserts, we’re also delighted that lots of genuine people will benefit. Our honest, upstanding friends in the legal fraternity, for example, who have years of prosecution and defence briefs to look forward to now that the genuine rule of law appears to be back in force. Not to mention the majority of true, honest-to-goodness Malaysians who have spent so many years waiting, and some of them possibly even praying, for freedom at last from UMNO-BN-style lies, fraud, fakery and also far worse. DEAN JOHNS, after many years in Asia, currently lives with his Malaysian-born wife and daughter in Sydney, where he coaches and mentors writers and authors and practises as a writing therapist. Published compilations of his Malaysiakini columns include “Mad about Malaysia”, “Even Madder about Malaysia”, “Missing Malaysia”, “1Malaysia.con” and “Malaysia Mania”. Posted in Character and Integrity, civil society issues, Corruption, Democracy, Dr. Ahmad Zahid Hamidi, Governance, Human Rights, Justice, Kleptocracy, Liberalism and Open Society, Malaysiakini, Najib Razak, Pakatan Harapan, Politics, Rosmah Mansor, Rule of Law, UMNO. COMMENT | Former minister Nazri Abdul Aziz is now brazenly saying out in the open that UMNO’s best-case scenario for future prospects is to support and team up with Anwar Ibrahim. More than any party here by far, UMNO is a collection of fat cats.They reached their heights of obesity and opulence by sitting in the free-ride comforts of a government they never imagined losing control of. Quite simply, almost all UMNO leaders have absolutely none of the integrity, experience, gumption, skill, drive, motivation, diligence, intelligence, passion, know-how, fibre, endurance (you get the idea) or interest really, required for being an effective or successful politician outside of the federal government. All the UMNO fat cats really want is a shortcut that will take them from the cold rain, in which they now shiver and starve, back into the warm government mansion they grew up in, to purr and preen in comfort amidst their never-ending gravy train. The path Nazri seems to be advocating offers exactly that, and all they apparently have to do is to create enough friction between Bersatu and PKR, and make sure that Anwar becomes the prime minister. As detailed in Part 1 of this article, Anwar could conceivably then dump Bersatu in favour of UMNO – especially if he starts to feel that Prime Minister Dr Mahathir Mohamed may renege on his promise to hand over power. Mahathir could of course react by calling for early elections. Perhaps it was in anticipation of such a scenario that Anwar started courting good relationships with the Malay rulers very early on, as a refusal by the palace to dissolve Parliament could complicate matters. Needless to say, Mahathir is far too intelligent to let such an outflanking manoeuvre happen without a response, and calling for early elections is likely a last resort rather than the first line of defence. I think this is the context of UMNO’s recent resignations – the post-Port Dickson timing of which could be no coincidence at all. Not every UMNO person buys Nazri’s plan. Indeed, while most of the party members do favour the fat-cat shortcut back to power, there appears to be considerable differences of opinion as to which shortcut in particular is best. The three main schools of thought seem to be: through PKR, through PAS, or through Bersatu. Nazri is probably correct in pointing out that going through PAS makes pretty much no numerical or ideological sense whatsoever. Perhaps the likes of Mustapa Mohamed and Anifah Aman(pic, above) are leaning towards the Bersatu route. This is an interesting response. 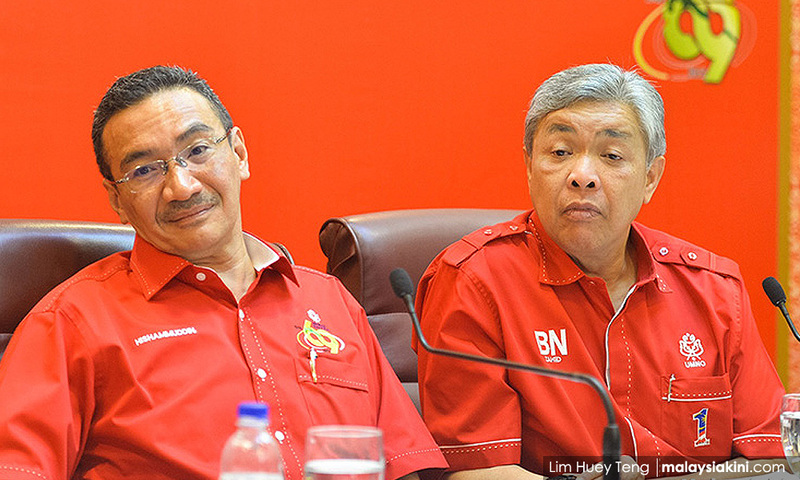 If there is a sufficiently large migration from UMNO to Bersatu, this could basically make Bersatu the new UMNO in terms of their position in the coalition – a big, Malay party that everyone agrees will nominate the PM. Splitting UMNO could also neutralise any effort by Anwar to use UMNO as a threat against Bersatu. If large numbers of UMNO MPs join Bersatu, then the UMNO support may no longer be the same bargaining chip it currently is. Then again, for all an outsider like me knows, Mustapa and Anifah could be the ones looking to join PKR. Either way, those who have left clearly do not have faith in UMNO as a bloc, and appear to be seeking their futures elsewhere. In summary, in this bizarre love triangle between Bersatu, PKR, and UMNO, almost any two-out-of-three combination essentially produces a workable win. There are a number of other factors, and/or radical possibilities. DAP will obviously play a big role, while PAS, PBB, Amanah, and Warisan will play slightly smaller ones. Then there is the Azmin Ali factor. Only while writing this article did the scenario occur to me: Especially if Azmin loses the PKR Deputy President’s race, what’s to stop him from defecting over to Bersatu? This solves a number of different problems for both Bersatu and Azmin. If the PKR elections go on in its current trajectory, the bad blood between team Azmin and team Anwar may be irreconcilable, and Azmin’s position within PKR may no longer be tenable. Azmin moving to Bersatu would give the party a more viable succession plan with regards to subsequent PMs (a Goh Chok Tong to Mukhriz Mahathir’s Lee Hsien Loong perhaps? ), and the numbers that could follow Azmin would also, again, help with Bersatu’s low-in-parliamentary-seats problem. An exodus from PKR to Bersatu would be even bigger if Bersatu goes multiracial – further reducing the role or need for a party like PKR. These battle lines are perhaps already visible in the copious amount of columns, blog posts, and viral Whatsapp messages that are either very strongly pro- or anti-Anwar, suggesting a consolidated and coordinated effort. Needless to say, all of this is speculation – and a somewhat sensationalist one at that. For all I know, we could see a smooth transition to Anwar becoming the next PM, a stable rota system put in place to determine future prime ministers, and Harapan continuing just the way it is, happy as a clam. Or, it could all be unrecognisable inside a year. It’s hard to say. All these seismic shifts are potentially possible in large part because ideology has almost never played a big role in modern Malaysian politics. The only vital and somewhat ideological question is how much of a factor race should be in Malaysian politics. This may come into play, say if Umno MPs need to decide which new party they want to support. Perhaps some see maintaining Malay supremacy as the priority, a goal which can only be achieved by supporting Bersatu or PAS, while others may prefer the PKR route. Other than that, Malaysian politics can likely be said to be dominated more by personality politics than anything else. It often comes down to which feudal lord one likes better. Of course, just because this is the way it is, doesn’t mean that this is the way it always needs to be. Changing the incentive structures and the architecture of our political system could largely eliminate the need for many of the conflicts above. One radical way to drastically cut back on inter-party conflict (such as Bersatu and PKR fighting over long-term stewardship of the PM’s post), is simply for all Harapan parties to merge. Many would cite mind-boggling logistical difficulties (true, no doubt), and extreme resistance to the idea by conservatives. If we think about it though, what function does having multiple parties in the coalition actually serve? The old BN model was simple, for the peninsular at least. We have one party for one race. If you are Malay and have a problem, go see UMNO; Chinese, look for MCA; Indian, MIC. It was devilishly simple in its concept, but simply devilish in the divided Malaysia it eventually created. What about the realities of today? Do we want to follow the old formula? Malays see Bersatu, Chinese see DAP, and Indians can see the new Malaysia Advancement Party? A merged party will still have leaders and elected representatives from every community that voters will likely find approachable. True, little Napoleons will perhaps find themselves with less power, but wouldn’t that be a good thing? It’s a bold idea that is unlikely to see the light of day, but regardless, I do hope we keep looking to radical solutions to blaze paths forward and leave behind the endless internal politicking that takes up far too much time and energy of Malaysian politicians. After all, all the intrigue and speculation is somewhat entertaining, but don’t we have a new Malaysia to govern? NATHANIEL TAN is eager to serve. Posted in Amanah, Anwar Ibrahim, Character and Integrity, Corruption, Crony capitalism, Democracy, Dr. Ahmad Zahid Hamidi, Leadership, Malaysia, Malaysiakini, Malaysian Yoda, Najib Razak, Pakatan Harapan, Parti Pribumi Bersatu Malaysia, PAS, PKR, Politics, The Malays, Tun Dr. Mahathir Mohamad, UMNO. Malaysia: Race-based power sharing coalition is here to stay? A lot has happened since May 9, when Malaysians decided to alter the political landscape of the country, electing a loosely formed coalition called Pakatan Harapan (PH) into government. A devastating blow landed on the once mighty UMNO-led Barisan Nasional (BN) coalition when, for the first time in over 60 years, it lost the mandate to rule. Never had I thought that this would be possible in my lifetime. I expected BN to lose a couple more seats but to win the election as usual. While the majority of non-Malays were expected to vote for the PH coalition, what surprised me was the fact that a sizeable percentage of the Malay electorate decided to ditch BN as well. Traditionally, the majority of the Malay population had voted for BN, fearing a loss of political power if they did otherwise. This trend was expected to continue but unfortunately this time, it didn’t. Dr Mahathir Mohamad had successfully provided the necessary comfort in assuring that Malay rights and privileges would continue to be protected even if BN was no longer in power. After all, it was Mahathir who had indoctrinated the concept of supremacy during his previous 22 years as prime minister. It will be interesting to see if the Malay electorate continues to vote for PH post-Mahathir in GE-15. Personally, I think it was the inability of the former Prime Minister to offer any reasonable explanation for his alleged involvement in financial scandals which influenced the end result. It is a little far-fetched that BN did not expect to lose power, and even more amazing that the former Prime Minister was detached from ground realities. Warning signs were all over that the people were disappointed and angry with the BN brand of politics, which was plagued by alleged corrupt practices and abuse of power and complete disregard for the principles of transparency, accountability and good governance. The only democratic value left was probably holding general elections on time. True enough, with the seizure of hundreds of millions in cash and belongings from premises linked to the former Prime Minister, public perception on embezzlement is slowly becoming reality. Since losing power, BN has been in disarray, desperately trying to recover from the shock election defeat. In such a situation, it does not help when one-time allies decide to jump ship and walk away with those who have newly acquired power. Effectively, there are only three parties left in the BN coalition, and at this point in time, it is not even certain if it will stay this way. There are obvious cracks visible even among its surviving members. In reality, this election defeat should be viewed positively as an opportunity for BN to review its structure and ideology, correcting the mistakes of the past and emerging stronger. Being in the opposition can be useful to test the newly laid foundation which can be continuously improved until the next general election is called. People will surely appreciate an opposition which roars responsibly in Parliament. Whether we like it or not, Malaysia’s political fundamentals are anchored in a race-based power sharing ideology, thus race politics will stay and BN is an established structure to effectively serve that purpose. All that BN needs is to adopt a moderate and inclusive approach moving forward. The majority will continue to claim rights and privileges while the minority will scream racism. This will not change even if the odds are tilted in any other way as we are a selfish and racist society. Darshan Singh is a FMT reader. Posted in Character and Integrity, Democracy, Dr. Ahmad Zahid Hamidi, FreeMalaysiaToday, GE-14 Malaysian General Election, Knowledge, Malaysia, Najib Razak, Pakatan Harapan, Politics, Racism, The Malays, Tun Dr. Mahathir Mohamad, Umno Baru. Any hopes that UMNO would somehow be able transform itself into a viable political party in keeping with the hopes and aspirations of the people evaporated last Sunday after Ahmad Zahid Hamidi and some of the worst, least credible leaders of the former government were elected to helm the party in the post-GE14 era. 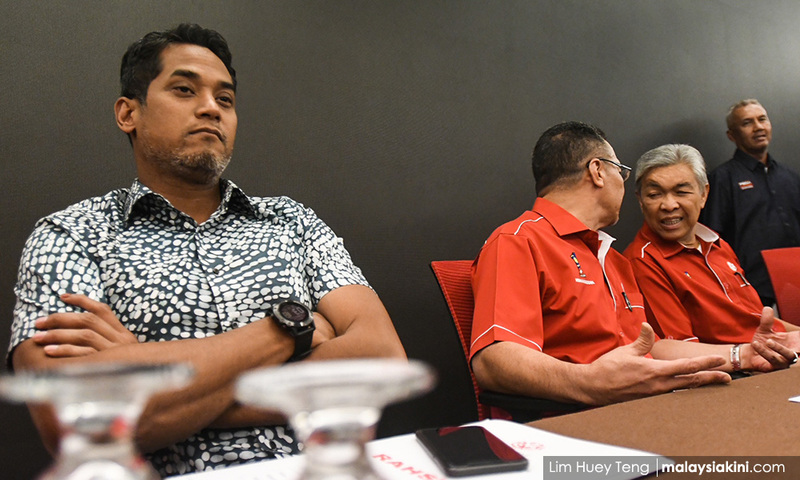 While polls suggested that the wider Malay polity favoured more open-minded and reformist leaders like Khairy Jamaluddin, party bosses went with the status quo. Money politics was also apparently at work once again. 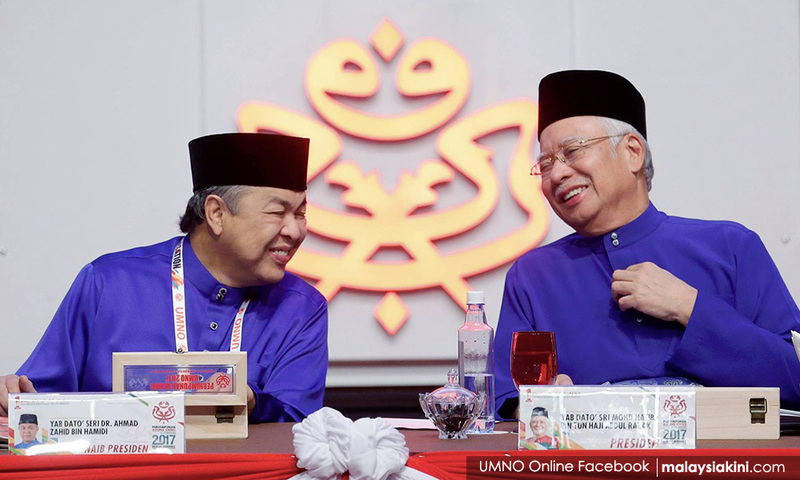 What we now have as the face of UMNO are the same people who were Najib Razak’s principal cheerleaders and collaborators, his proxies in effect. To see the very people who were complicit in all that went wrong during Najib’s administration now strutting around talking about democracy, professing their respect for the Rule of Law and complaining about money politics, is simply revolting. And to watch them pretend that the massive corruption and abuse of power that attended their long years in office was somehow a minor detail, or that they lost the election merely because of the “non-conventional approach” taken by Pakatan Harapan (to quote Zahid) is to witness monumental self-deception first-hand. The fact is, the kind of massive corruption and abuse of power that went on during the last couple of decades was not just the work of one man – it was a team effort in every sense of the word. Every last one of them aided or abetted Najib by commission or omission. They lied or remained mute witnesses when they should have spoken up. They obfuscated the truth and consciously misled the public to the very end, and continue to do so even now. How many of them now trying to refurbish their image would even dare declare their assets? Zahid himself, now under investigation on a number of issues, deceived the public when he claimed to have met the mysterious Saudi who supposedly donated RM2.6 billion to Najib. And now, in response to allegations that some RM800,000 in personal credit card bills were charged to his foundation, he says it was all an honest mistake. Perhaps, but what people want to know is how does a politician rack up RM800,000 in credit card bills in the first place, and then pay it off without so much as a second thought? And then there was the shocking re-election of Jamal Yunos (pic above), a racist demagogue given to empty-headed gestures and a fugitive from justice to boot, as division chief. What does it say of UMNO if such obnoxious people can find favour within its ranks? What we have then, for the most part, are leaders without principle or honour, and without an iota of remorse for all the wrong they did. They betrayed the trust of the people and their obligation to protect and defend the constitution. Entrusting the leadership of the party to the same bunch of unprincipled and opportunistic leaders that were rejected by the voters on May 9 only suggests that Umno members still do not appreciate the full measure of the disdain in which many ordinary Malaysians hold their party. In the hands of such men, nothing more can be expected from the party than the racism, bigotry and dishonesty of the past. In a harbinger of things to come, Najib, their mentor, disgraced and rejected as he is, is claiming that the PH government is neglecting the Malay agenda, sidelining the national language, and undermining the position of the Malay rulers. And this despite the fact that nobody, absolutely nobody, has done more to damage the interests of the Malays than he and his party. They pretended to be defenders of the faith but defrauded the faithful; they claimed to champion their race but massively cheated their own people. What Najib and UMNO cannot and will not see is that PH’s election victory was in fact a victory for the Malays by the Malays. Finally, the Malays have rid themselves of the “bangsats” that entrapped and impoverished them in the dead-end politics of race and religion while laughing all the way to the bank. Under more progressive Malay leaders, the Malays themselves are now free to soar like never before. And the higher they soar, the more irrelevant Umno will become. History, it is said, has a way of catching up with the follies of men. 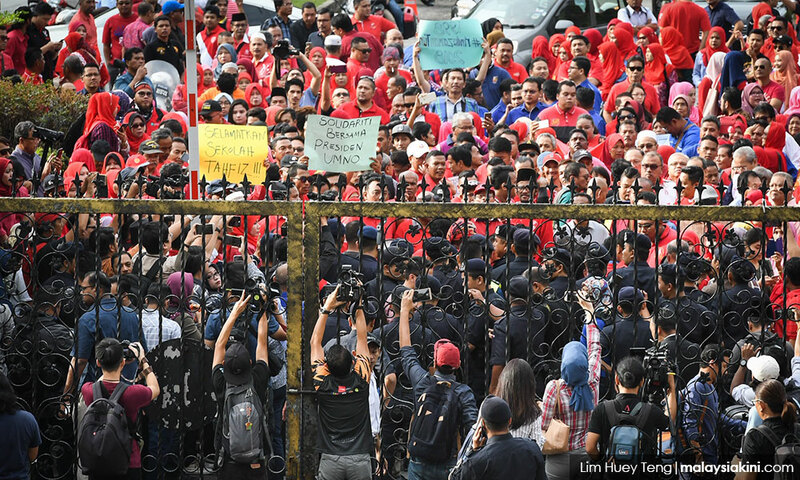 The moment party leaders rejected Onn Jaafar’s proposal to make UMNO an inclusive big tent party fighting for the rights of all Malaysians, it sowed the seeds of its own destruction. While many pretended for years that there was something noble in its struggle, there was, in fact, nothing redeeming about its racist approach to nation-building. The final chapter in UMNO’s sordid saga is now being written by the investigators looking into all the allegations of its corruption and abuse of power. When it comes to full fan, many more UMNO leaders will be joining Najib in infamy, and the insidious nature of UNMO will be laid bare for all to see with devastating consequences. 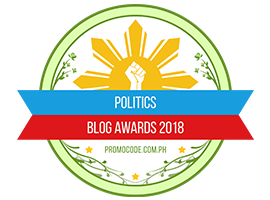 Posted in Character and Integrity, civil society issues, Corruption, Dr. Ahmad Zahid Hamidi, FreeMalaysiaToday, GE-14 Malaysian General Election, Governance, History, Kleptocracy, Leadership, Malaysia, Politics, UMNO, Uncategorized. 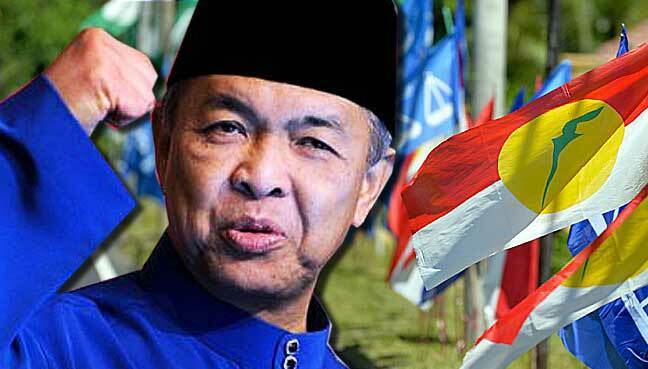 COMMENT | The results of the UMNO polls are in and the internal pressures for meaningful reform have been thwarted. It would appear that the election of Najib Razak’s proxy Ahmad Zahid Hamidi as President has prevented the party from bringing about needed changes from within. 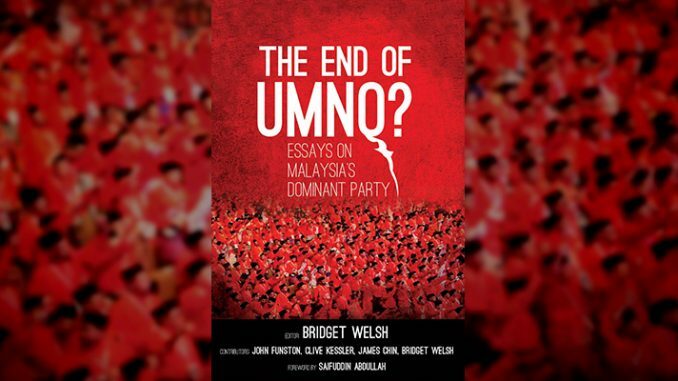 A closer look at the election campaign and results, however, shows that UMNO is seriously divided, and there is in fact an ongoing revolt within the party that is far from over. The struggle between “old” politics – money, warlord pressure, insularity, entitlement, racial rhetoric and unquestioned loyalty to the leader – and “new” politics – ideas and policies, more national and substantive engagement on issues and with communities, and greater empowerment of the grassroots – played itself out in the party campaign. The dominant narrative of the party election was one of reform. History was made with a televised public debate, brought about by Tengku Razaleigh Hamzah’s challenge to his competitors, and there was an unprecedented level of competition for leadership positions. 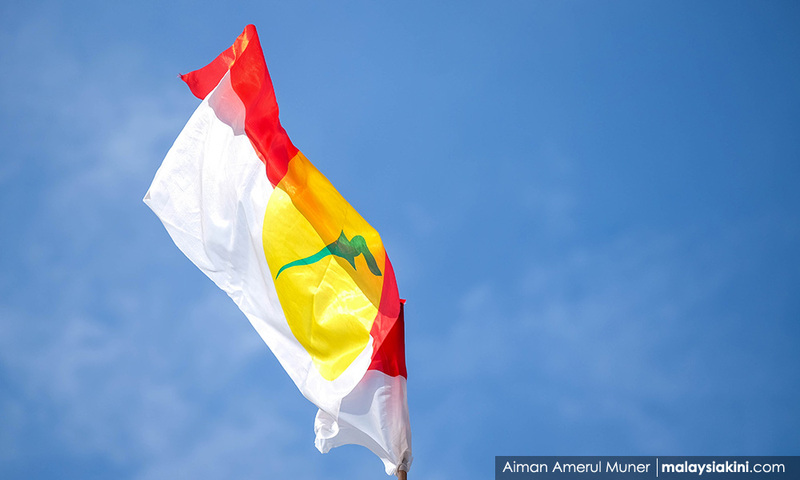 Unlike the hotly-contested 1987 party election, the 2018 UMNO election provided clearer choices for the direction of the party, as opposed to primarily supporting different personalities and camps. The outcome of the election revealed the control of vested “old” interests in the party with the election of Zahid and many in his camp, notably Vice-Presidents Ismail Sabri Yaakob and Mahdzir Khalid and Wanita Chief Noraini Ahmad. Over half of the incumbent division chiefs and deputies were returned, with 37 percent of them unopposed. The share of Wanita incumbents returned was even higher, with over half of these 56 percent contested. At the supreme council, the results show a predominance of incumbents as well. The forces for status quo held onto power. They did so largely by using money and pressure politics – “instructing” delegates how to vote. “Duit raya”, or rather more aptly “duit rakyat”, was used to buy delegates, with some envelope payouts allegedly reaching over RM1,000 per delegate. These tactics were combined with the feeding of the view on the need to defend the party against “enemies” and the mistaken delusion that it was a matter of time before UMNO would get back to power through alliances with new partners and divisions within the ruling Pakatan Harapan. The main proponent of this defensive and denial politics is Najib, who used his influence to assure that his proxy(ies) won so that he can continue to feed on sympathy within the party and secure a (mistaken belief in a) safe landing for himself. Many of the warlords and division chiefs, who were responsible for keeping Najib in power after the 1MDB scandal was revealed, joined the ‘Najib pity party’ out of self-interest and self-preservation, and pressured the delegates to toe the line. Many of the delegates rejected these pressures, some outrightly in a revolt and an embrace of “new” politics, while others through more indirect resistance. The results show that while “old” forces won pluralities, they did not win consistent majorities. The number of branches that favoured reform candidates – Razaleigh and Khairy Jamaluddin – outnumbered those that favoured Zahid, 53,054 to 39,197, and votes within an overwhelming majority of branches were sharply divided. The fact that the reform camp was divided, split between Razaleigh and Khairy, undercut its success. Yet the “winner take all” electoral college system of the election also weakened the vote for reform, as those incumbents holding position had more sway in the final outcome as they comprised the bulk of the 160,000 delegates. If UMNO had a more democratic electoral system with all of its grassroots being able to vote, the outcome would have revealed that the majority of the party members want change. They are trapped in an undemocratic electoral system that disempowers members and advantages incumbents. The results show that despite this imbalance, the revolt in UMNO is strong. The supreme council contains many of those closely linked to the Khairy camp, notably Zambry Abdul Kadir, Abdul Rahman Dahlan and Reezal Merican Naina Merican, among others. Annuar Musa’s defeat is perhaps the most obvious sign of this discontent. He was perceived as the candidate closest to the Najib-Zahid camp and most actively reportedly engaged in vote buying. In a head-to-head contest, he lost to Mohamad (Mat) Hassan, Khairy’s cousin and seen as more aligned with reformers. Khaled Nordin’s (photo) victory as Vice-President is also illustrative, as he was most openly aligned to the Razaleigh camp and advocated for change in the party campaign, most obviously by repudiating money politics. The challenge in this campaign was that given its brevity, the time to build clear alliances in the reform camp was limited. The reform movement, as a whole, lacked clear candidates as to who the reformers were at the supreme council, divisional and branch levels. These contests were largely about personality and personal loyalties rather than the direction of the party. As such – despite the revolt within UMNO for change – delegates had little choice in bringing about that change in the lower-level contests of the party to sustain the needed support to offset the institutional advantages and stranglehold of control that the “old” politics of Najib-Zahid maintain. The election, however, was only a battle, for the war inside UMNO continues. There are three trends that are likely to continue. The first is an exodus from the party. So far, three elected parliamentarians have left to become “independent”. This trend will continue, as Zahid does not have the confidence of large shares of the party. As many as half of the parliamentarians may leave, with even more at the state level. It remains to be seen whether those leaving will form a different party, but the split inside UMNO is real. Zahid’s victory is a defeat for the party, as it has meant that the party will not hold together. This could come in the form of large numbers leaving, resulting in a split or more gradual attrition and disengagement. Either path points to an erosion of support within the party itself. 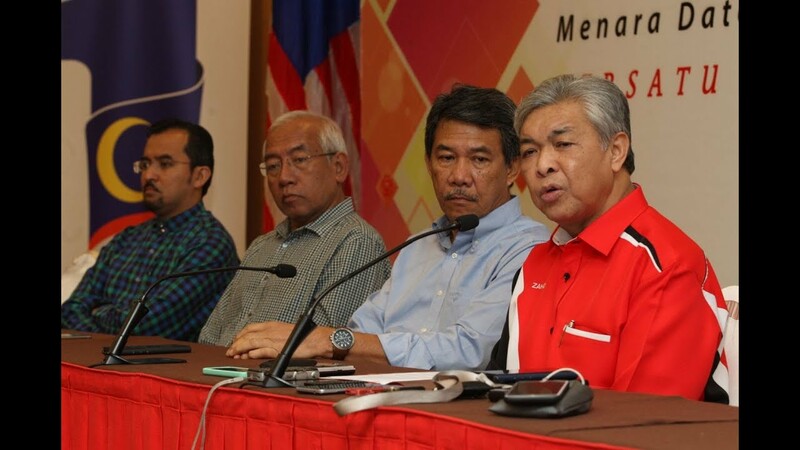 Zahid’s victory has made UMNO an even greater political target, as he not only perpetuates responsibility for the scandal of 1MDB in the party leadership, he brings his own scandals and baggage. Zahid is not popular by any measure among the general public. He is currently not able to command the respect of the voters, including a majority of UMNO voters. Zahid’s poor showing in the UMNO presidential debate did little to bring respect to the party among the public and this trend will continue with Najib continuing to overshadow his proxy. 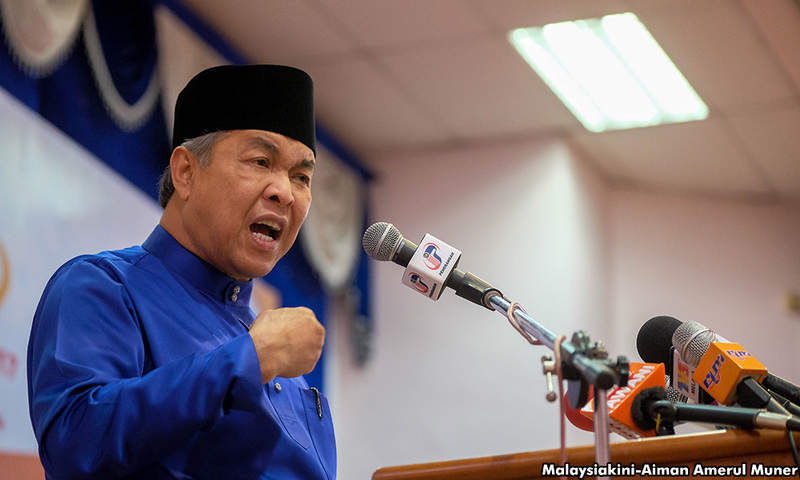 Zahid – and UMNO as large – will face the continued wrath of voters who demand accountability over 1MDB and further scandal revelations will bring even more contempt. Zahid’s visit to the MACC today will likely not be the first. He will not be alone in having to face questions about the finances and money within the party, as the election of the “old guard” makes the entire leadership more vulnerable. 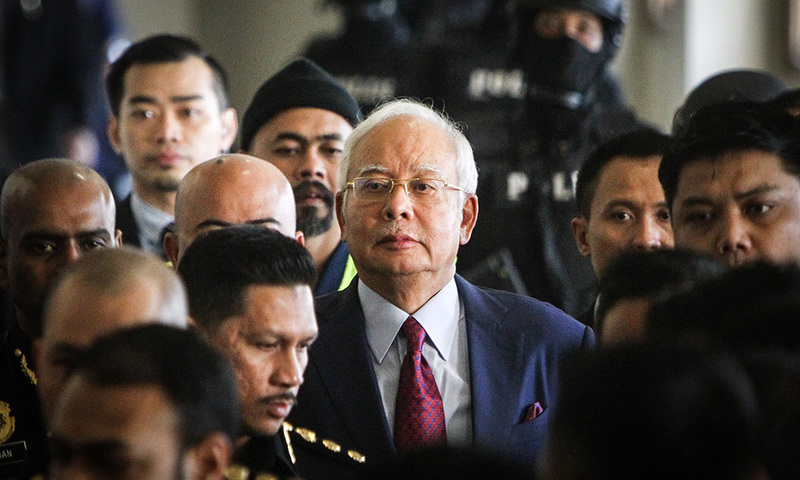 Najib’s claim that 1MDB was used to “help” the party and the cash in his apartment was actually UMNO money – his practice of using the party for his own defence – is now haunting the party as a whole. Ironically, many of the victors in the UMNO polls are actually losers, with the losers actually winners. Khairy (photo, far left) and Razaleigh have both come out of the contest stronger than when they went in, standing up for change and advocating for a more hopeful alternative future for the party. Sadly, Najib’s continued hold over the party in alliance with many warlords and the debacle of his leadership has rained down further suffering on UMNO. The third trend is one where there will be efforts to survive the internal divisions and external censure. This will likely follow the same “old” playbook of Najib – denial and defensiveness, cash-and-carry politics, ratcheting up race and religious rhetoric and the use of underhanded undemocratic tactics. Expect greater outreach to PAS under Zahid’s proxy leadership, with efforts to mobilise more conservative religious and racial forces. 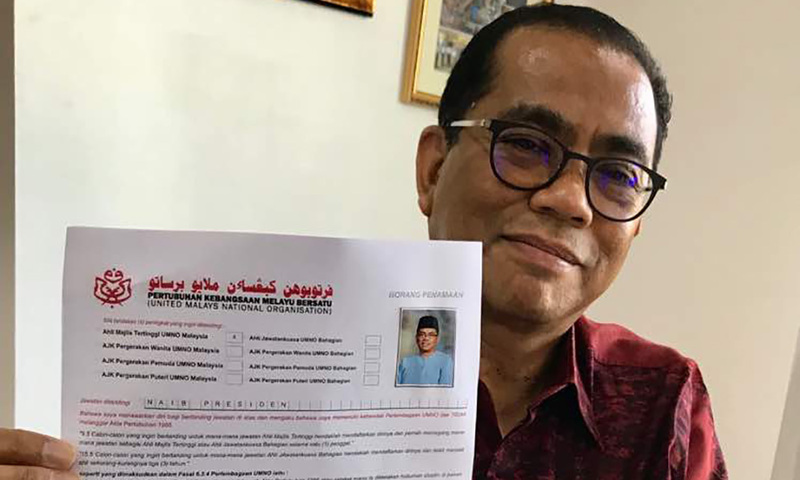 The election of non-reform aligned religiously conservative UMNO Youth chief Dr Asyraf Wajdi Dusuki will likely further enhance this trajectory. Sadly, this sort of approach–old politics with an even deeper conservative religious orientation–will only undermine UMNO further as it cannot attest to any moral high ground with its current leaders. But the denial and insularity of many leaders in the party blind many inside to how destructive this path will be, both for UMNO itself and Malaysia’s social fabric. Offers of defection and disturbing discourse are coming in a climate of desperation as those elected try to hold the party’s debilitation at bay. Historically, splits in UMNO, legal challenges for the party and defensive responses have been dangerous times in Malaysian politics. This time, however, UMNO is in opposition and the dangers it faces are primarily self-destructive. This does not mean that there will not be spillovers, creating greater political uncertainty in Malaysia, as new Malaysia still contends with forces of the past who are doing everything in their power to survive and perhaps inflict damage to Malay body politic and Malaysia’s image abroad. BRIDGET WELSH is an Associate Professor of Political Science at John Cabot University in Rome. She also continues to be a Senior Associate Research Fellow at National Taiwan University’s Center for East Asia Democratic Studies and The Habibie Center, as well as a University Fellow of Charles Darwin University. Her latest book (with co-author Greg Lopez) is entitled ‘Regime Resilience in Malaysia and Singapore’. She can be reached at bridgetwelsh1@gmail.com. Posted in ASEAN, Character and Integrity, Corruption, Democracy, Dr. Ahmad Zahid Hamidi, GE-14 Elections, Kleptocracy, Leadership, Malaysia, Malaysiakini, Meritocracy and Competence, Najib Razak, Politics, Security, The Malays, Tun Dr. Mahathir Mohamad, UMNO.